(Dodge City, Kansas) August 27, 2015–Miss Kitty and Matt Dillon have been part of cultural history for sixty years this September. Their names have been in songs, books and stories since they first graced the small screen in the legendary Gunsmoke series. 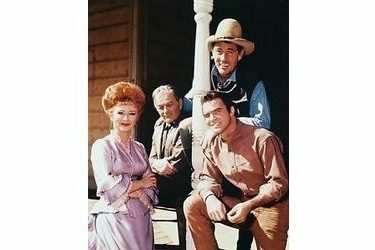 From 1955 to 1975 families gathered around their television sets to see the latest drama unfold in the Wild West. The series still stands as the longest-running prime time, live action show. Sixty years later, audiences still cheer on Marshal Dillon as he brings justice to the streets of historic Dodge City. Wild West Heritage Foundation with Boot Hill Casino & Resort and Roundup Rodeo have announced celebrity appearance in Dodge City for September 25-27, 2015. Burt Reynolds, who portrayed Quint Asper on the series from 1962-1965, and Buck Taylor, who portrayed Newly O’Brien on the series from 1967-1975 are two of the last three remaining series regulars. Both are scheduled to attend Anniversary events in Dodge City, Kansas. These six legendary Gunsmoke actors, actresses and writer get the heck into Dodge to celebrate the sixtieth anniversary during this year’s Wild West Fest celebration on September 25-27, 2015. The anniversary celebration will kick off with Gunsmoke Under the Stars, a showing of a variety of episodes along with video messages from the cast on September 25 at the South Drive-In Theater in Dodge City. On Saturday, September 26, 2015, fans are invited to a public Question and Answer Panel beginning at 10:00 AM at Roundup Rodeo. Meet & Greet sessions for autographs will also be available during the day. For tickets and information, please visit DodgeCityWildWestFest.com. Wild West Fest is a joint partnership between Boot Hill Casino & Resort, the Wild West Heritage Foundation and the Roundup Rodeo that showcases the legendary history of Dodge City’s past and still celebrates the present day cowboys through the Kansas Pro Rodeo Finals also scheduled for this weekend. Wild West Fest will be fun for both residents and visitors of all ages, and will feature multiple events, including Taste of the Wild West, Wild West Beer Fest, Jared Daniels Band concert, and Gunsmoke Under the Stars.